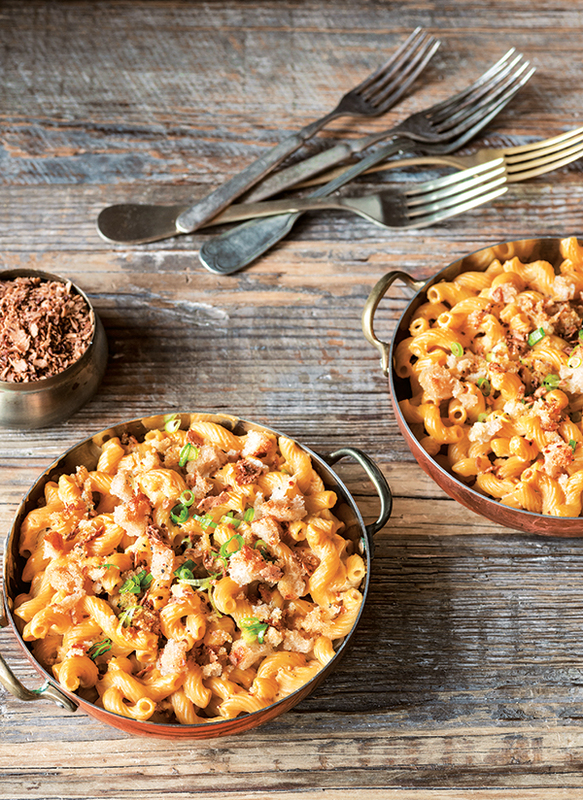 Get your comfort food fix with this Smoky Mac ’n’ Cheese with Coconut Bacon from Great Vegan BBQ Without a Grill by Linda & Alex Meyer! Growing up in New Jersey, the word barbecue meant the grill or a party that involved cooking things on the grill (as in a backyard barbecue). In my family, we often barbecued burgers, potatoes, and corn with coleslaw and potato salad on the side. Barbecue was also a kind of sauce, but we didn’t often use it when grilling. So when I was older and I heard people talking about great barbecue, I figured it meant a fun backyard party that involved grilled food. Of course, I now know that barbecue,or BBQas it’s often called, is a way of cooking meat, usually pork, with various styles of bbq sauce, and it’s verypopular in the South. Different Southern states tend to have their own style. Since anything you can do, we can do vegan, vegan barbecue isn’t unheard of. We can pull jackfruit, marinate meaty portobellos, and grill burgers that will please just about any carnivore. 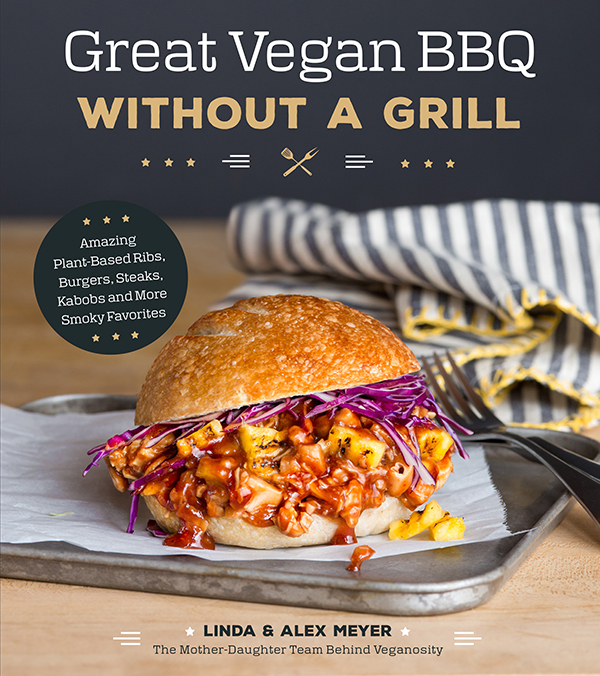 Linda & Alex Meyer have made vegan barbecue even easier with their new book Great Vegan BBQ Without a Grill. As you may have guessed from the title, Great Vegan BBQ Without a Grillis chock-full of vegan barbecue recipes that don’t require a grill. 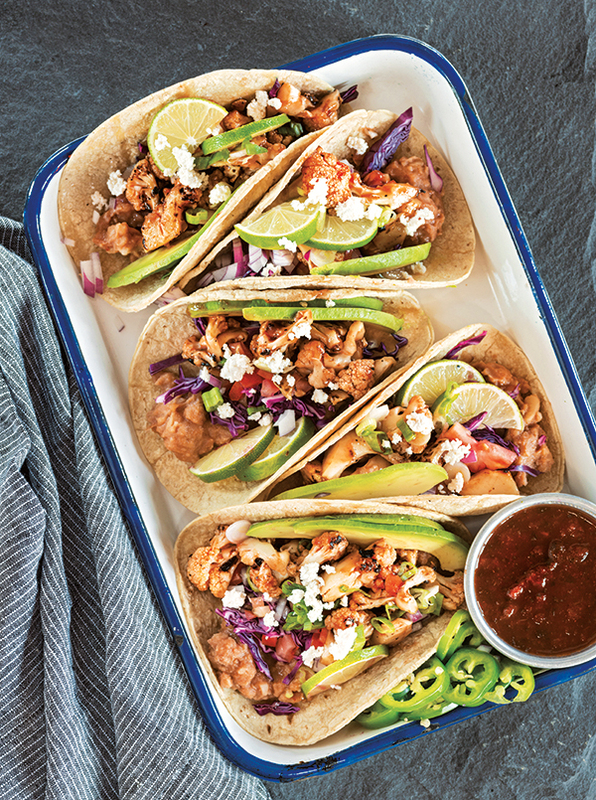 The recipes are inspired by their family road trips to South Carolina, Louisiana, and Texas, and they’d satisfy just about any barbecue aficionado. 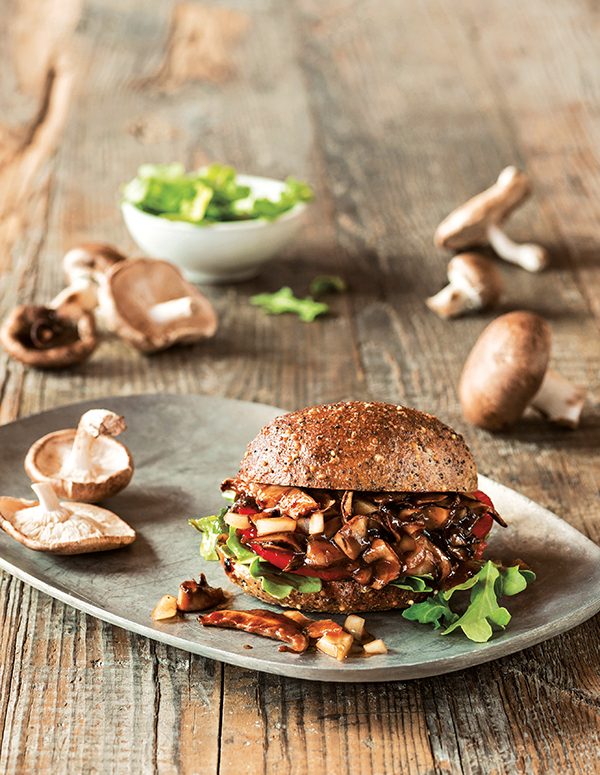 In Great Vegan BBQ Without a Grill, Linda and Alex show how to easily replicate the smoky flavors and textures of classic BBQ with recipes like Classic BBQ Short Ribz, Pulled Shiitake Mushroom BBQ, and BBQ Jerk Chik’n. You’ll find recipes for burgers, not dogs, and “meats.” Linda and Alex use vegetables, beans, tofu, and seitan to recreate the familiar textures of traditional barbecue, and they include lots of recipes for sauces and dressings to recreate the familiar tastes. Of course, no cookout would be complete without side dishes, so veganized versions of traditional favorites are included in Great Vegan BBQ Without a Grill, too. You’ll love the Grilled Corn on the Cob with Cilantro Avocado Sauce, Carolina Coleslaw, Smoky Skillet BBQ Baked Beans. There’s a chapter dedicated to dips, too, because you can’t have a party without dips! You definitely need to try the Buffalo Chick’n Dip and the Grilled Artichoke Dip. When I get a new cookbook, I almost always make its mac and cheese recipe first, if it has one. Growing up on mac and cheese (thought it was boxed), it’s one of my favorite comfort foods. The Smoky Mac ’n’ Cheese with Coconut Bacon from Great Vegan BBQ Without a Grill did not disappoint. In this dish, a creamy cheesy sauce is made from cauliflower and cashews, and it’s poured over pasta. It’s then topped with a smoky coconut bacon, which gives the dish a deliciously crunchy contrasting texture and flavor. I’ve also made the book’s Boot Kickin’ BBQ Cauliflower Tacos, which I absolutely loved. I can’t wait to dig into more of the recipes in Great Vegan BBQ Without a Grill! Next up, the NOLA Grilled Beef Po’ Boys! When we think of Southern comfort food, we think of mac ’n’ cheese. This decadent and soul-warming dish is a favorite in the South and the Midwest, especially at backyard BBQs. This is why we had to remake the standard mac ’n’ cheese into a vegan version. The cashew cheese makes it just as creamy and comforting as dairy cheese, only a whole lot healthier. And don’t skip the coconut bacon, because it adds that “sumpin sumpin” that only bacon flavor can. Preheat the oven to 350°F (176°C) and line a rimmed baking sheet with parchment paper. Mix the coconut flakes with liquid smoke and spread them evenly on a lined baking sheet. Bake the coconut for approximately 7 minutes, or until golden brown. Remove them from the oven and then set aside. Boil the water in a small pot. Once boiling, add the cauliflower and boil for 15 minutes. Drain the cooked cauliflower and place in a high-speed blender or food processor. Drain and rinse the cashews, and add to the food processor with the almond milk and lemon juice, then blend on high until smooth and creamy. Add the nutritional yeast, garlic, garlic powder, paprika, salt and pepper to the cashew cream and blend until well incorporated into the cashew–cauliflower mixture. Set aside. Cook the pasta according to the package instructions. Mix in the cashew– cauliflower mixture and pour into a baking dish. Combine the olive oil and breadcrumbs together and sprinkle on top of the noodles. Set the oven to broil, place the mac ’n’ cheese on the top rack of the oven and broil for 5 to 10 minutes, or until the breadcrumbs turn golden brown. 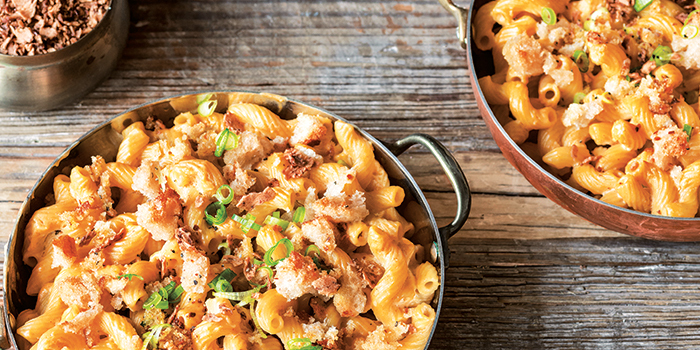 Serve by topping the mac ’n’ cheese with the coconut bacon and green onions. Reprinted with permission by Page Street Publishing. Photography by Kelly Allison Photography. Photography by Kelly Allison Photography.